Undertale is an indie game that came out only half a year ago. I hadn’t heard of it at all until the GameFAQs 20th anniversary game contest, where it managed to get nominated… Surprisingly or not, with the dedication of its fanbase, it managed to turn around its first match, against Mass Effect 3, and make it in the best 64. After that match, seeing the game’s potential in the contest, I posted on GameFAQs’ contest-related forum that I’d play and review Undertale if it won the whole contest. A couple of weeks later, it had won, easily beating the likes of Fallout, Pokemon, Mario, Zelda, and Smash Bros., and I had a promise to fulfil. 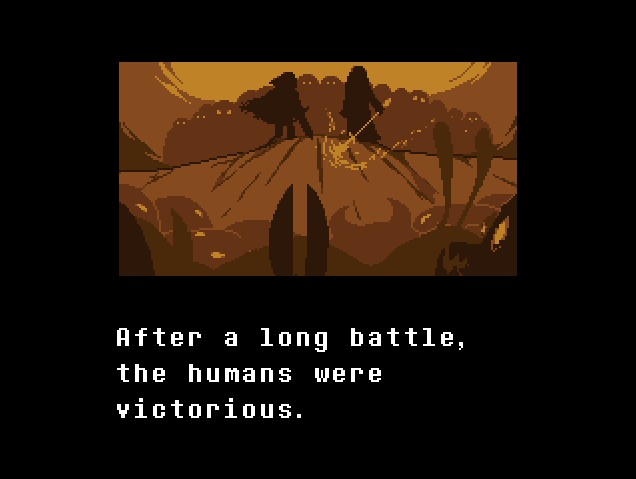 Well, after some 14 hours of playtime, I have finally beaten Undertale, and I must say that it exceeded my humble expectations. This is not just any indie RPG – it is a product of the love and passion of Toby Fox, a dedicated EarthBound fan, that should not be easily overlooked. In the rather lacklustre indie scene of the last few years, Undertale shines brightly. 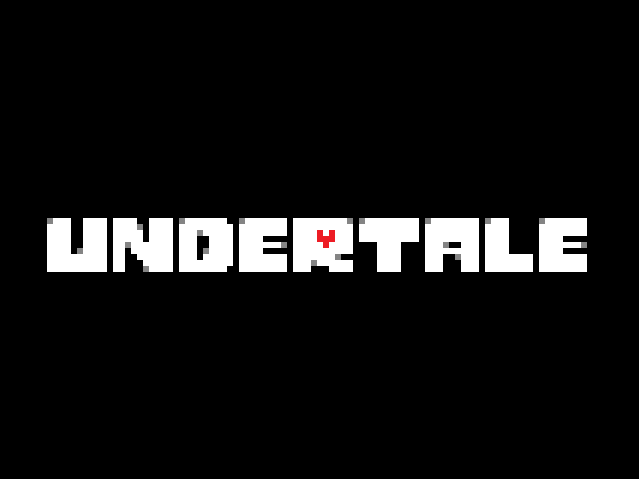 Undertale is a relatively short, considering its genre, but fulfilling experience. Its short length comes mostly at the expense of the padding seen in most other RPGs – almost the whole way through the game, meaningful things will be happening. EarthBound, and the Mother series as a whole, is a huge inspiration for the game, quite evident in its humour and fourth-wall-breaking. There is also a blatant “nerdy” vibe about it all. Your choices and actions are very meaningful and WILL affect how the story develops – most importantly, whether you choose to destroy the monsters in your path, or talk them out of fighting. There are multiple endings, and there are other details on the path to each ending that will differ depending on how you play, too. 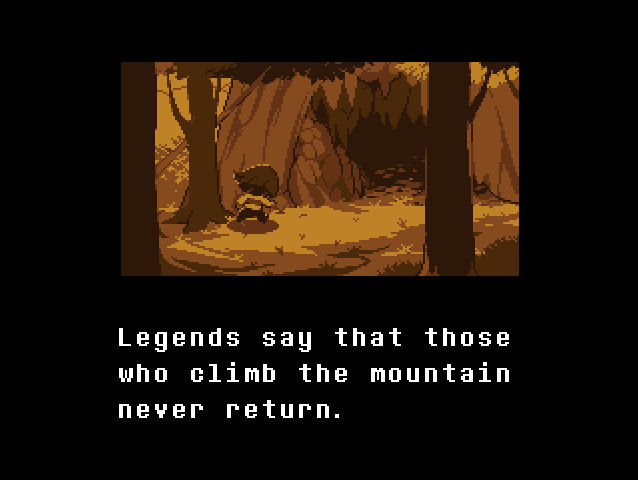 This is the main strength of Undertale, along with the strong message it carries. 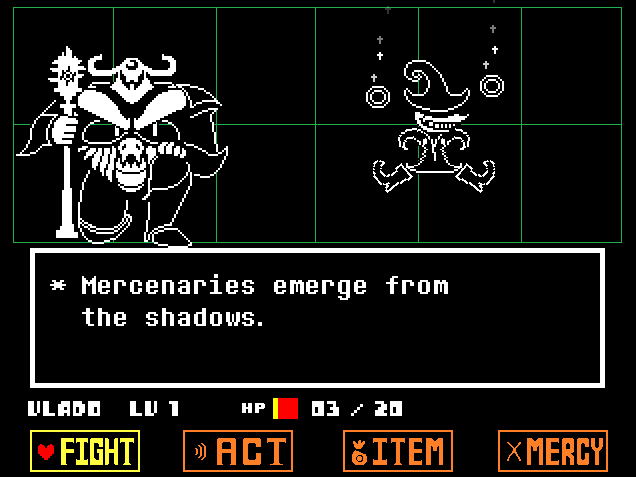 The battle system is also unique, more reminiscent of a shoot-’em-up game than an RPG, only further cementing the conclusion that Undertale is not just any RPG. The story follows your adventure, as you explore a world of wonder where monsters just try to make a living, sad that they had been banished from the upper world. You find out that, aside from their appearance, they are not too different from humans. They also have towns (one of them named Snowdin after the modern-day hero), hotels, bars, they also watch TV… You encounter interesting creatures and develop a liking for this monster-kind as a whole… Eventually, you find out that your adventure can change the fate of humans and monsters, maybe even end the bitter hatred between them… And your actions during the course of the game will determine that outcome. Undertale’s story works thanks to its fascinating cast of characters. You can actually befriend many of the noteable monsters you encounter on your path to freedom, and thus open new opportunities ahead. 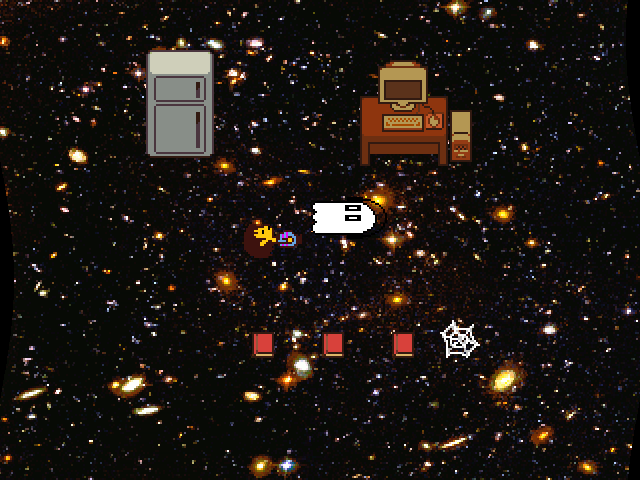 The main character even has a phone and can call some of his friends and chat whenever he wants. 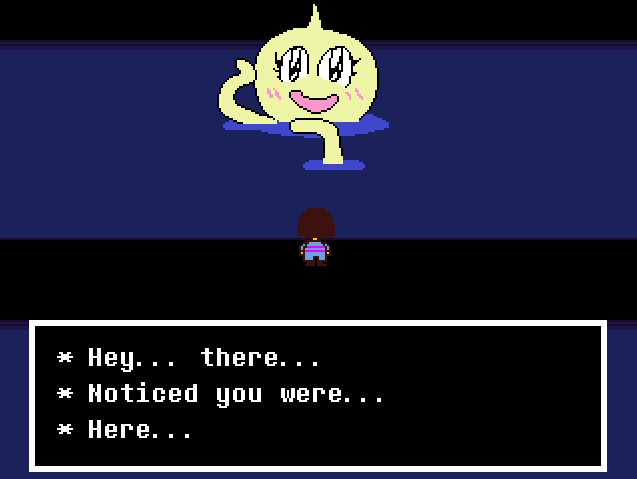 As soon as the game starts, you encounter the evil flower Flowey, and then the goat lady Toriel, who comes to the rescue, and proceeds to take care of you, also teaching you how to solve puzzles and how to avoid fighting when confronted by monsters. 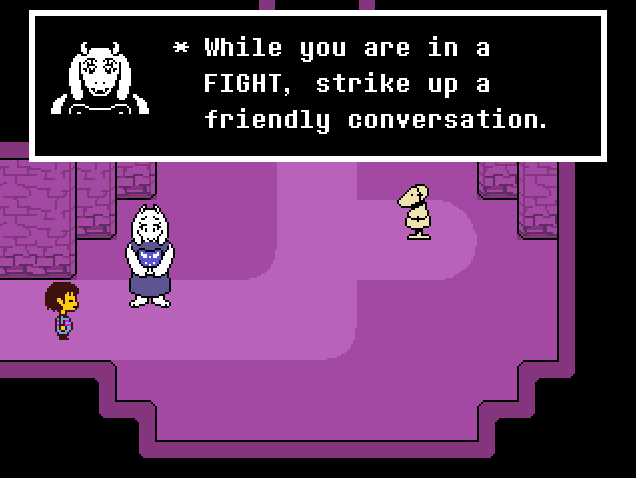 Toriel is a total mother figure with her worry and dedication despite you being a total stranger, and human, at that. One can’t help the positive emotions witnessing this. But my favourite character appears a bit later, a weird skeleton named Papyrus whose goal in life is to become a member of the Royal Guard – the elite warriors under The King of Monsters who must capture any human they come across… His brother Sans is one with a very strange sense of humour, but you can get used to him (how quickly, it depends on your own sense of humour). There are also the socially awkward scientist Alphys, the groovy ghost Napstablook who likes composing beats, the robot Mettaton who is hungrier for glory than any living being (and another big favourite of mine), the fierce warrior Undyne who will stop at nothing to destroy you, the incredible spider girl Muffet… Eventually, you may even meet the King himself – another interesting character with rather unexpected behaviour. It’s a diverse cast, each of them with very distinct personality, and their interaction with you and between each other make this game what it is. As for the villains, you can surely guess you will encounter Flowey again after the brief initial confrontation… But, other than that, who will oppose you, and who will be the strongest of them, depends largely on your own actions. 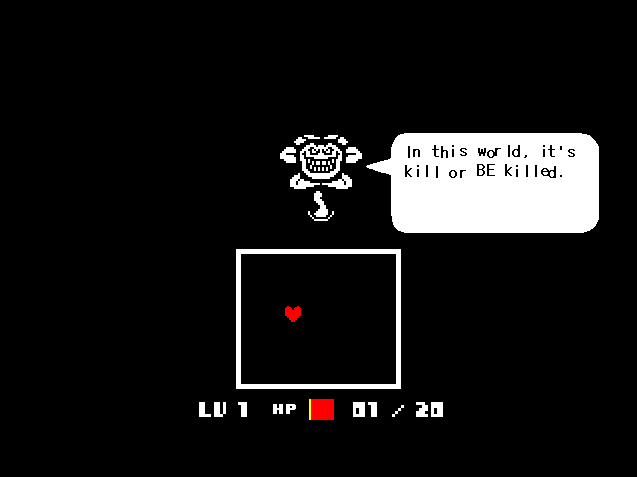 And, if you actually choose to fight and kill these monsters you have just found out to be much alike to humans… Are you not the villain of Undertale yourself? 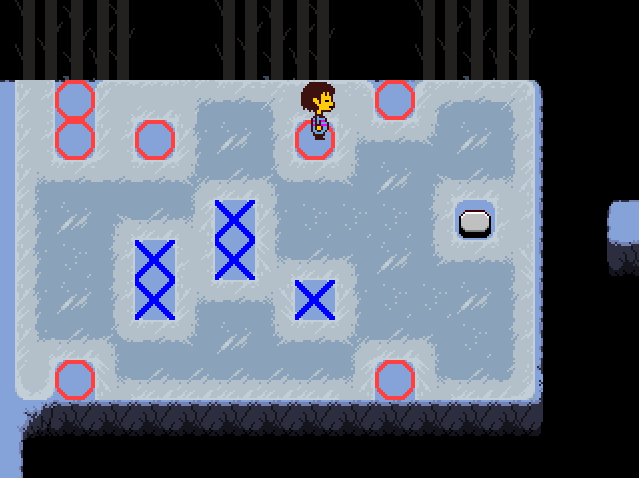 Undertale’s gameplay is quite unorthodox, like most of the game. At first sight, it’s boring sidescrolling – there is no world map or anything like that, you just scroll through screens, running to the right… And sometimes, you need to backtrack, which is tedious… You can naturally talk to the creatures you encounter, get hints for your road ahead, and just learn what their daily lives are (an important point in any RPG). Then, you enter a shop, and you see a different screen with a menu… Aside from buying items, you can chat about lots of things with the shopkeeper, and shops are the places for the most valuable hints. But, once you enter a battle, you’ll realise that this RPG’s gameplay is anything but boring or typical. 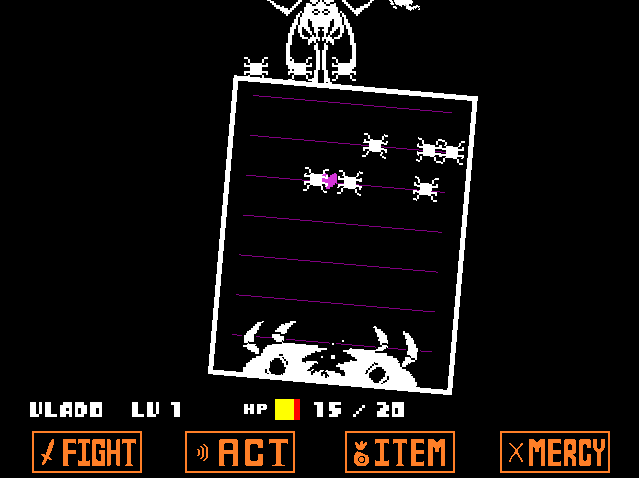 Battles in Undertale are extremely weird. They are turn-based. If you attack, you will be trying to hit the centre in a rectangular field representing the opponent with a line (your aim) scrolling back and forth… Not very exciting. 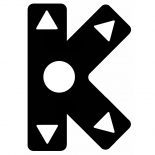 But the fun comes when you need to defend from enemy attacks… A little heart represents your soul, and you need to navigate around a rectangle (how big it is, it also depends on the enemy), as the enemy showers you with its unique attacks. This is usually reminiscent of “bullet hell” games, although rarely as extreme in its difficulty. Should you get hit, you lose HP, and some monsters can bring your HP to zero with just a handful of successful attacks. Sometimes, avoiding enemy attacks is even more difficult, as the means of attack and your means of defence occasionally change. All this goes for regular and boss battles alike, but there are also some special battles where everything is completely different. And… a certain robot will challenge your wit with completely unexpected ways of battling. Anyway, as mentioned before, there is always the option to get out of the battle without killing your enemy. Against regular monsters, you can often just run away, or convince them not to fight you with words and actions that will be present in the menu. Some of them will work, some won’t, and often you’ll need the right combination of actions in order to get the monsters to decide not to fight, so you can “spare” them. Against bosses, you can’t escape. You will need to persuade them of your good intentions. Somehow. Boss battles, as a whole, aren’t that different from regular ones, although, of course, the attacks you’ll have to endure will be more fierce. Be sure to keep healing items stocked up! 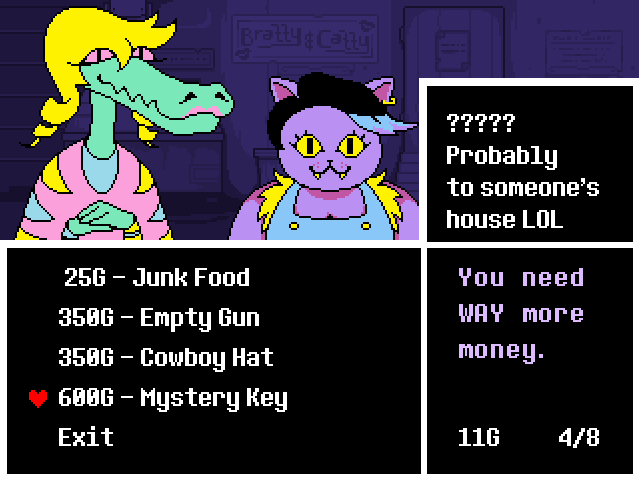 Speaking of items, the Undertale inventory is quite simple. As far as equipment goes, you only have a weapon and armour. And, to be honest, I’m not sure how much good they do… I played through the game avoiding fighting, and it has to be said things sometimes to arbitrary damage. Still, I tried to keep the best armour I had equipped, and hoped for the best. There are also many types of healing items you’ll be able to use. Those are crucial for your success. The game also offers many puzzles. Monsters really like those! Naturally, as you go along, puzzles will get harder than the initial few Toriel uses to teach you, but the compulsory puzzles are never hard. There are a few optional ones which are harder, but you can safely play through the whole game without ever solving them. The EarthBound vibe is everywhere in this game! A lot of strange monsters will remind you of creatures you encounter in Nintendo’s gem, their dialogue – even more so. Breaking the fourth wall is what this game does – and it goes much farther than EarthBound or any other game I’ve played… And this is deeply intertwined in its very mechanics, even. Yes, do not be surprised if you come across a situation where you will chat with a boss about save files… Many characters have their unique sense of humour. Add to that the inspiration drawn from general nerd and internet culture… This game truly has a soul. As far as visuals go, Undertale is just an 8-bit game. Your character’s model is incredibly simple, for instance – a long-haired youth with the clear goal of being a complete avatar. Some of the monsters have very fascinating models, however – not only the important characters, but even regular enemy encounters! The creativity of Toby and his graphical artist add a lot to the game’s charm. The soundtrack is not that great, but works – with over 100 tunes, even if some of them are altered versions of others, it enhances the experience, and there are a few songs that one might remember even after beating the game. My favourite that I’ll also use to illustrate this review is “Another Medium”, which plays in Hotland. 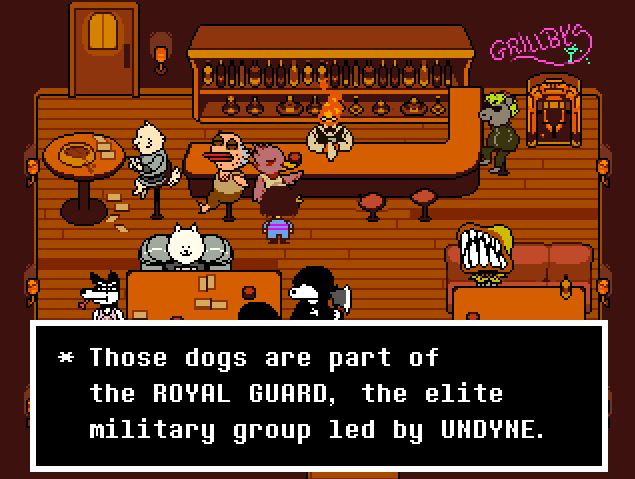 Undertale is a game many would say could only ever exist as an indie game because it’s not afraid to take risks and does exactly what the author’s vision intends… It’s a game that reminds us of the strength and potential of the medium in a time period where we’re flooded with polished, but ultimately artistically mediocre products. With its branching paths and the significance of your choices, it dwarfs the likes of Mass Effect with a laugh, despite the infinitely smaller scope, universe, and production costs. Whether it appeals to you or not, you have to admit its humour carries the unique soul of a game we only rarely have the chance to encounter. 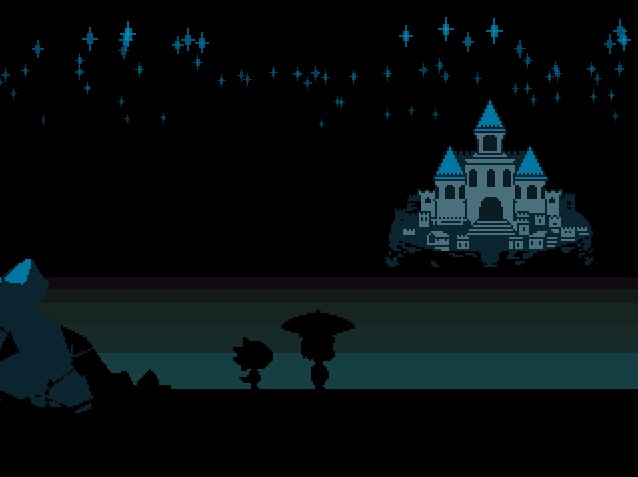 Yes, Undertale’s story is not particularly deep, nor are its characters. The gameplay sure is unique, but isn’t particularly amazing, either. 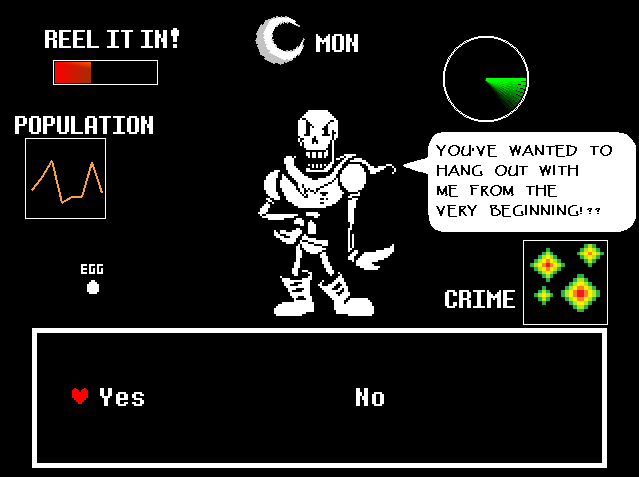 But it is the combination, and how all the components work together, that make Undertale an RPG well worth playing – whether you are a fan of the genre or not. The Mother/EarthBound and internet culture references – subtle enough to always remain lingering and never overwhelming, are sure to keep you entertained even if you have to face occasional frustration with boss battles. 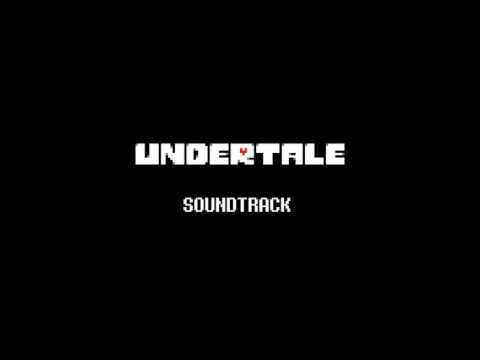 In a nutshell, Undertale is a game with a soul that you deserve to play. Great review! Pretty much summed up my feelings toward the game. I was a little more favourable of the soundtrack though. This game definitely lived up to the high praise it was given.